If there’s one area where marketing has given itself a bad rap, it’s where practitioners have failed to prove marketing’s impact on the bottom line. And nowhere is that business disconnect more apparent than in social media marketing. We social media marketers like to breathlessly talk about “likes” and “followers” and “shares.” And while we know these somewhat intangible measurements are important to us in terms of reach and priming potential customers, they really mean very little when it comes to proving our efforts’ worth to business executives and owners. But can true social media return on investment be calculated or determined? Should it be? It depends upon whom you talk to. This is where marketing points of view diverge significantly. A large group of marketers will start talking about content reach, engagement, sentiment monitoring, likes and retweets — metrics unique to this shiny thing called social media. To be fair, we talk this way a lot amongst ourselves. But when these are used as hard business justifications, it signals a marketing problem with metrics reporting. The other, savvier group will talk about actual ROI — financial investment and its return, the accepted measure of success in business. This group will talk about cost-per-click, cost-per-lead and cost-per-conversion. These are metrics used across marketing channels and are understood by all business functions. The first group sees social marketing as a unique undertaking, exempt from the most basic of business requirements. But social marketing, as we like to say at SocialProse Media, is just marketing. Its fundamentals are not different, and neither should its metrics be. In fact, social marketing should be an element of a well-integrated marketing plan, and its ultimate success should be determined the way every other marketing effort should be: by ROI. ROI is what it all comes down to, ultimately. Social marketing is resource-intensive. It takes a significant, consistent and long-term time investment to be successful, and often, it also requires hard costs such as video production, hiring content creators, and advertising. Therefore, those successes need to be quantified in terms of how the business benefits from that investment: sales volume, revenue and cost. Otherwise, how does the business justify undertaking social marketing efforts? Or any marketing efforts at all, in fact? I’m not saying that likes, followers, engagement and reach aren’t important — they are. Nurturing relationships with potential and current customers have been shown to lead to higher acquisition and retention. Engaging customers who offer positive and negative comments through social media is part of good customer service. “Listening” provides your company with valuable feedback that can be used to refine your customer models and improve the customer experience. The list really can go on and on. But too many marketers fail to understand that the intangible metrics aren’t the final place their analytics reports should land. The fact is, social media is an extremely useful and effective marketing tool; it’s a soft lead generator if there ever was one. But most often, social media isn’t where sales happen. Social marketing is great at building trust, priming potential customers, and ultimately, sending then to a website where they can be converted to hard leads. If social marketing can demonstrably increase website visits, and website visits provide a direct link to sales conversions and subsequently higher profits — well, that’s worth making a financial investment in social media, isn’t it? Business owners and business executives at the end of the day don’t care much about how leads are generated, just that they are. 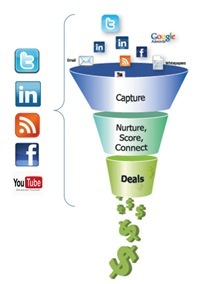 But they need to understand how social marketing fits into the sales funnel and how that justifies a budget. “Likes” and “retweets” doesn’t answer that for them, but ROI will. In my next post, I’ll talk more about measuring social ROI, and creating a business case for online marketing.